Are you looking to build your website using bootsrap framework? 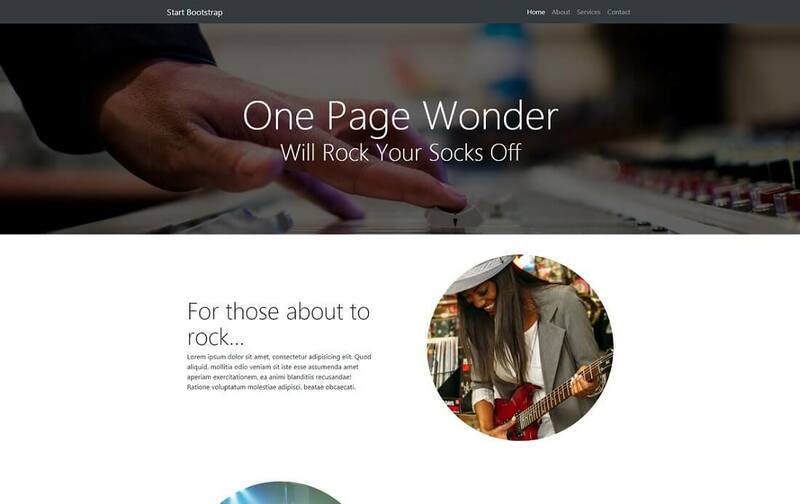 Here are a list of some of the top, coolest and Free Bootsrap 4 website templates online. 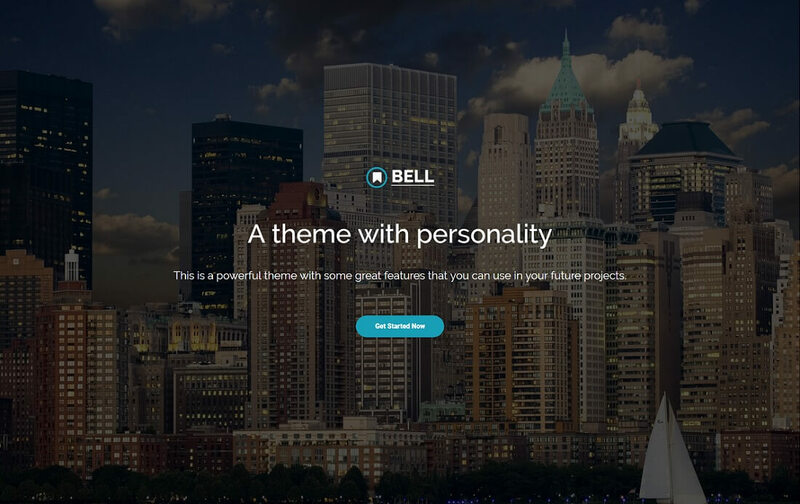 Bell is a creative free one-page website template which you can use for various industries and business purposes. It can be easily customized and used by agencies, finance, startups, construction, consulting and even cleaning service businesses. You can just change the images, texts and colors and you are ready to rock. It is a multi-purposeful item which adapts to your needs and requirements and makes your online presence a memorable one. You sure must ensure the best possible user experience to any visitor that stumbles across your business page. Built using Bootstrap Framework, Bell template is flexible and instantly readjust to the device guests use for browsing the internet. Parallax blocks, animations on scrolling and counters are a few of the condiments it treats you with. The layout is full-width with a stunning full-page image above the fold. Call to actions are strategically placed on the website to increase the potential of the lead generation. You can use Bell for your personal and commercial projects and on unlimited domains. With the download, you also receive free updates and don’t have to bother about bug fixes. You are sorted with all, you just enjoy the benefits that come with the creation of a functional and practical website. Do you plan to launch your very first blog but don’t know how to make it look as professional as possible? The struggle is over. 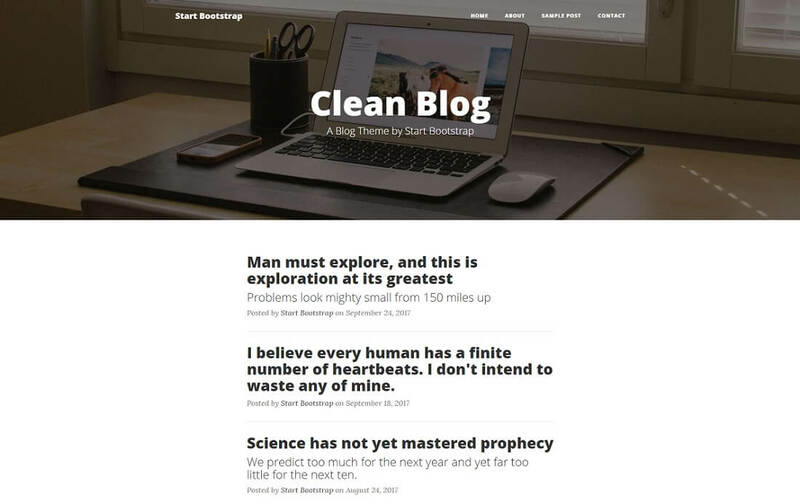 Here is Clean Blog, a free bootstrap 4 website template for blogs of all types. Bear in mind, it is a really clean, hence the name, web design. If in need to have a straightforward blog with simple and modern design, this is the one perfectly suitable for your needs. Header section allows you to add a full-width image and create a useful page navigation. Meanwhile, the footer is dedicated to social media icons and copyright info. In between is your compelling content which will make readers intrigued and hungry for more. Keep it updated on a regular basis and enjoy the growth of it. The overall experience will be 100% distraction-free and in blog posts, the menu appears only when you begin scrolling back up. Moreover, Clean Blog free blog template comes with a working PHP contact form with validation. Basically, just add your email address to the included PHP file and you can start receiving fresh emails from fans. To go in-depth with the customization process, LESS files are included. Add a touch of personality to stand out from the crowd. Everyone enthusiastic about healthy and active living, Fitness free bootstrap 4 website template serves you with all the necessities. It is a one-page layout with a very vivid design what helps you grab the attention effortlessly. Share your passion with the world and help others who want to jump on the healthy living journey. Either you are a personal trainer, nutritionist, fitness or a gym owner, Fitness template takes care of your requirements. Heck, it over delivers and has your page up and running in little to no time. It might take you a little extra time if you are a newbie. Still, you probably won’t need to spend more than an hour or so to start seeing some results. Quick, easy and efficient, exactly what you need when starting out something new in the online space. Just like getting in shape is a fun adventure, make building your website fun and exciting, too. Like with all the rest, the first step is the hardest. If you are going through this collection, you pretty much completed the most difficult part. You only need to pick the tool you fancy most and start putting things together. Give it a shot, test the waters and enjoy the business growth. 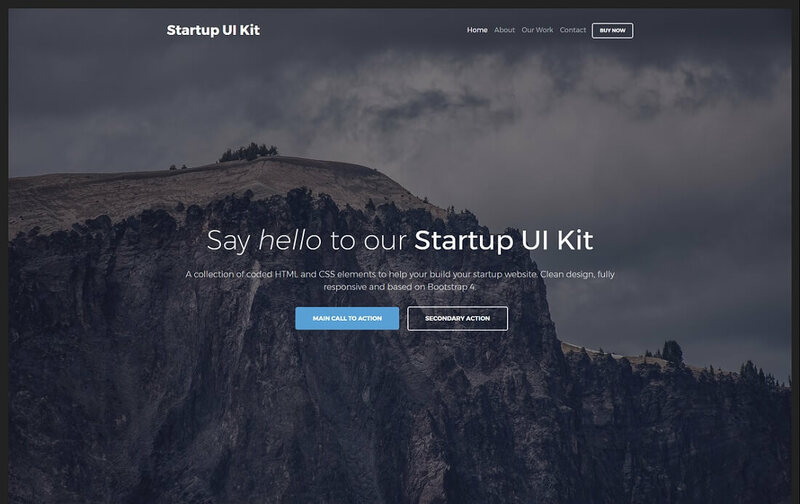 Both for startups and those launching a new product, Startup UI Kit will make building websites easy as pie. No need to have any serious coding or design skills, you can all take the tool to your advantage and hammer out one fantastic web design for your online project. All the must-haves come with Startup UI Kit which play a crucial part at engineering the desired landing page and help you with the launch. The final product will turn out to be of a professional’s work even if you aren’t actually one. Most of the work regarding coding and designing is finished. On your end, you only need to add content, rearrange elements, exclude those which you do not need and include others. Play around with the possibilities and forge an amazing selling machine. The free version of Startup UI Kit contains 16 of total 50 different cards. Cover, content, call to action and footer cards to name a few. Startup UI Kit will rapidly speed up the building of your website. From the initial idea to realization won’t pass much time. Roll up your sleeves, but there is no need to work your tail off to reach expert-level results. Some are inspired the most by the pure simplicity. White background, black font and blue links, nothing else. If that is you, boy we have an elegant free template for you. 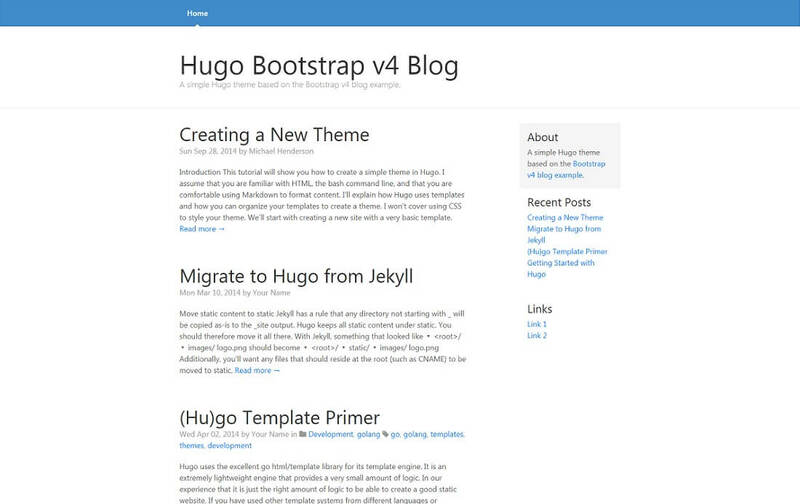 Meet Hugo Blog free template based on Bootstrap 4 Framework for the simplest blogs out there. When sharing mostly text with little visuals, it is best to have as little distractions on the site as possible. With Hugo Blog, you can quickly achieve the needed and have an entirely distraction-free experience. Let it be from mobile phones or from tablets, everyone can enjoy reading your articles almost like reading a book on a Kindle. However, even if Hugo Blog is as simple as a template can get, it is packed with features. Needless to say, due to Bootstrap 4.0, it is responsive and loads quickly. It supports multi-lingual content, is cross-browser compatible and welcomes Disqus comments. The layout is static but if you would like to improve it, feel free to perform tweaks and follow the documentation’s suggestions. Whatever it is you intend to achieve with Hugo Blog, you will do it with ease. No need to search for another free blog template if you rely on the basics. In some cases, the name speaks for itself. Creative is a free Bootstrap 4 website template for creatives, agencies and small businesses. Of course, you can use it for other projects easily. With small changes, you can quickly achieve a completely different look. Speaking of changes, it is enough if you replace the images and fonts and a new design is fabricated. Use your creative mind and modify the web design in your own fashion. Creative template readjusts to any screen size, comes with fixed navigation and cool scrolling animations. Custom buttons, full-page image header and portfolio gallery with hover effects are a few additional goodies of Creative template. Across the whole one-page website, call to actions are strategically placed to help you increase your business potential. The overall design of the template is very professional and contemporary. Craft an entirely new website or redesign the current one. Use Creative as a great starting point for your next online project. Test the waters and learn the basics of site building and the power of Bootstrap Framework, too. You can use it purely for educational purposes or to start doing business, taking new projects and gigs. 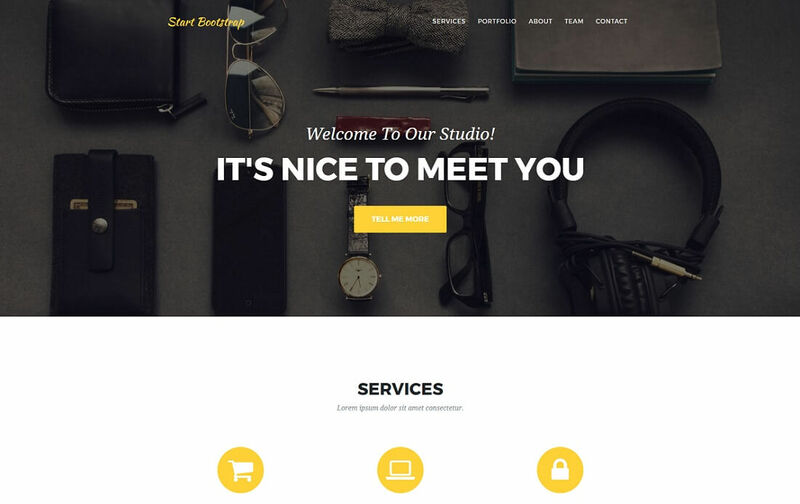 Style for miles, that is what you get with Agency free Bootstrap 4 website template. However, no website gives you the best results if it is only elegant and stylish. It should be useful and beneficial to the end user, too. You get it all with one candid, yet highly functional free template. Creative agencies and small businesses, even individuals, get a complete solution for fabulous web presence with Agency template. Services section features circle only Font Awesome icons similar to the team member section where profile images are circle shaped. Each profile is treated with a short introduction along with social media links. Let clients know exactly who is standing behind your brand name. Furthermore, About Us sector has a responsive Bootsnipp timeline. In footer, you can include social media links, copyright info and other useful links. As far as getting in touch with your team goes, working PHP contact form is included and even comes with the validation. To make it work, simply add your email address to the PHP file. Let your products and services shine with Agency free portfolio template. You can witness a boost in emails soon after the launch happens. Always be prepared with a fluid template. With mobile browsing on the rise, it is a must to have a mobile-ready website. Not only does a great user experience give you more chances to win over the guests, but search engines will also love your page more. This calls for higher rankings and more organic traffic. And when your business has something to do with mobile apps, you sure must not be lacking modern technologies and a functional website which everyone will enjoy from all types of devices. Smartphones, tablets, laptops and desktops should experience the same quality. 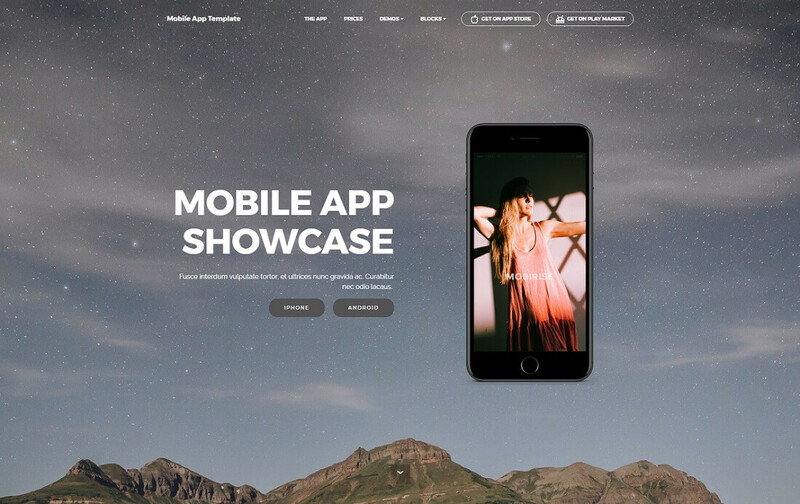 Mobirise’s Mobile App free HTML Bootstrap template takes care of both flexibility and extensibility of your page. With more than 50 blocks and predefined demos, you have a one-of-a-kind website forged in minutes time. Video background, parallax effect, pricing tables, blog and testimonials are just a few of the supplements of Mobile App. Menu luxuriates visitors with great navigation along with external links to app stores where they can get the product. Animations further entertain users and have them stay on the page for much longer. The longer they remain on your app landing page, the more information they will gain about your product. Potentially, the more familiar visitors get with it, the higher the chances of becoming loyal users. 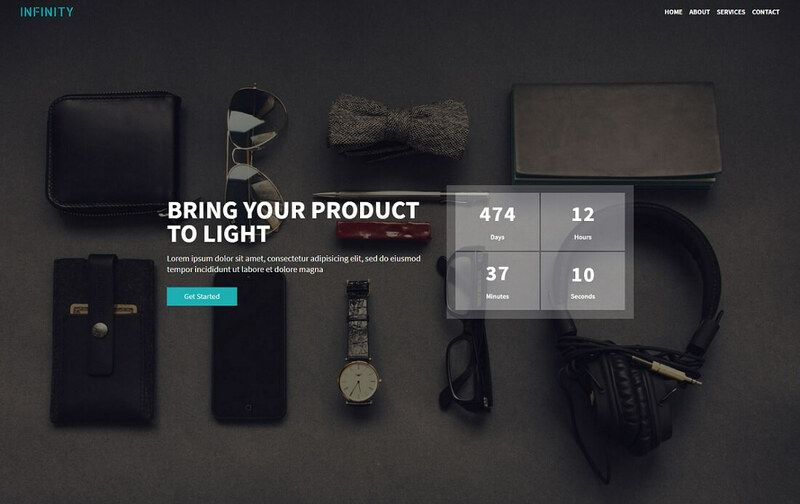 The sister of a bigger brother, Engage Lite is a free multi-purpose Bootstrap 4 website template. 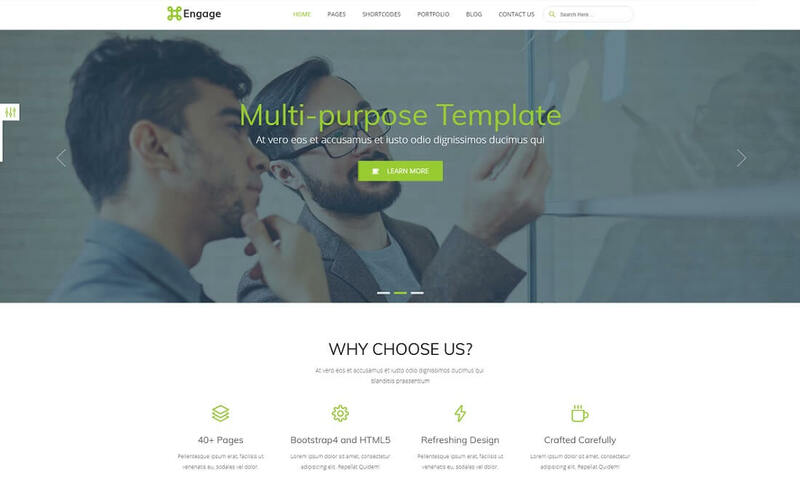 Mentioning the brother, along with the free version, Engage originally comes as a premium template with even more features and possibilities to create an extraordinary business website. Still, with Engage Lite, your site will look professional and modern. It is a great chance you have to test things out, see how it goes and if you truly like the design, step up the game with the premium version. Or stick to the lite version if it has just enough amount of goodies to run and maintain your project’s page smoothly. Based on the HTML5 and Bootstrap 4 Framework, Engage Lite is easy to customize and ideal for online portfolios, agencies and all sorts of businesses. If there is a need, you can also put together a complex multi-page website. It is you who are in charge what type of a web design you will establish with the splendid template, Engage Lite. The features are superior, the usability and customization effortless and the scalability highly doable. No need to be setting any limitation, go above and beyond your belief and start shaking the industry you are in. Regarding user intentions, Grayscale template is multipurpose, yet at the same time, it is a one-page layout. In other words, use the free Bootstrap 4 website template for all types of businesses. 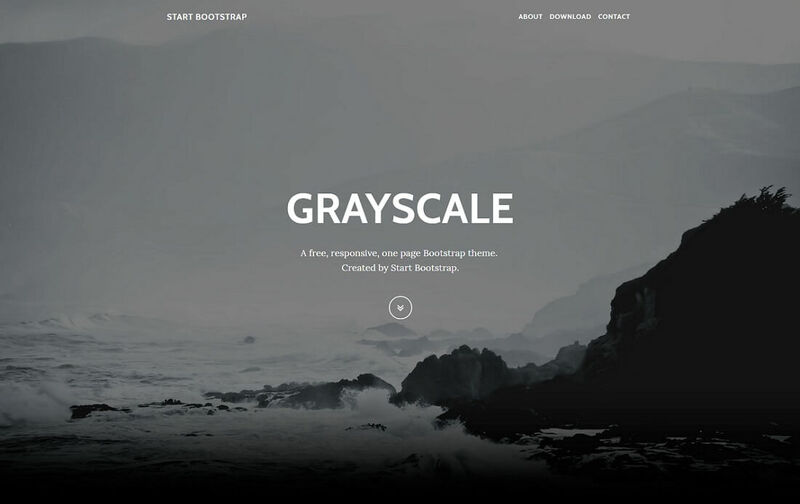 Even if you need a personal website, showcasing your superb work and promote your services, Grayscale template is a great item to go with, too. The features it includes cover all your requirements and then some. But there is one catch. Not really. You probably already solved the riddle that is hiding behind the name of the template. It features a sophisticated dark layout which is a great attention grabber. Black is a strong color which helps you astonishingly display your work. Fixed menu collapses on scroll but still sticks to the top so you have access to every section at all times. Active page section is highlighted with Scrollspy so you know exactly what is your site location. This is especially handy if your page is constructed of many sectors what makes it longer than you are used to. One super cool feature of Grayscale free Bootstrap template is the integrated custom Google Maps. Additionally, you can also customize the PNG map marker, making it follow your branding. 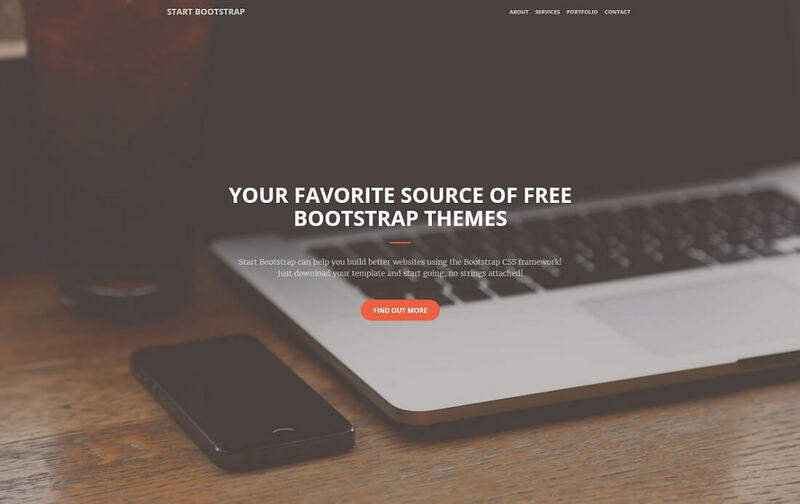 Simple and to the point free Bootstrap 4 template for businesses which don’t have a website yet but need one. In the online era we are living, online presence is a must for any business. Not only business, freelancers and professional individuals are also building official websites to showcase their masterpieces more and more. Social media works to some extent, but when you want to go pro-level, a page is advisable. Or we should rather say, a necessity. With our collection of best free Bootstrap 4 website templates, you have complete freedom when it comes to designing the kind of a page you fancy most. Business Casual template is one of those which does not hide anything. It goes straight to the point, so visitors know what they are in for right off the bat. It is great when you are just starting out. Very minimal in the design and features, yet still just the right amount of them to craft a functional website. However, you will need to get/build a contact form on your own. For now, the template is without one. Other than that, contact page supports Google Maps, photos are by Death to the Stock Photo and the fonts are custom. Basic Lite template is not so basic once you start putting it to use. It is packed with features you can take to your advantage for developing the page you are in need for. 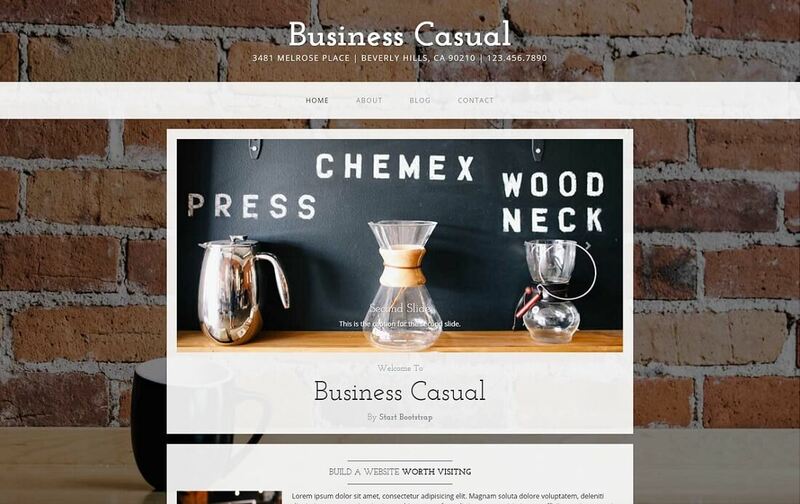 Multi-purpose template for agencies, landing pages, online portfolios and other types of business websites. The neat and elegant style with various animations on the scroll and other essentials come with Basic Lite template. 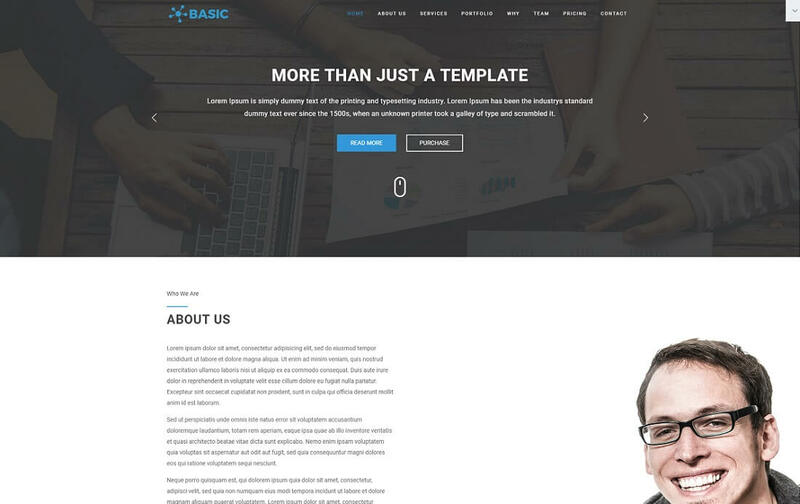 The best part is that once you get the gist of it and if you need to scale things further, you can purchase the full version of Basic responsive Bootstrap 4 template. On the other hand, if you are fine with the features and serve all of your needs, feel free to use the lite version forever. As a novice, Basic Lite can be ideal to start things off in the online space. (Not) Surprisingly, even if you are building your first ever website, it will still look like one with years of experience did it. Become the one whose work is professional in every sector of his business. Although the work you excel at will do most of the talking, it is still essential that how you present it online is as expert as it can get. Landing page style Bootstrap website template for promoting mobile apps and other products and services. 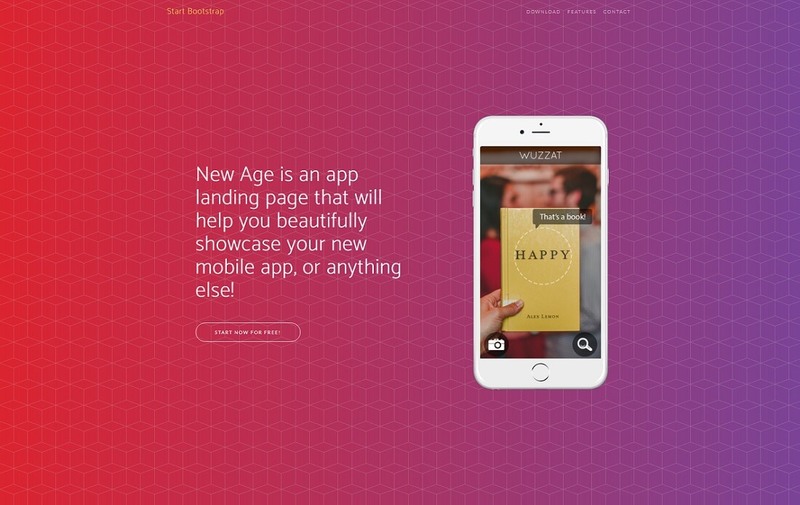 New Age template will let you beautifully showcase your incredible new application and help you increase downloads, lead generation or sales. It features a bold and very colorful web design with various sections which will break down the presentation professionally. Navigation is sorted with fixed menu and scrolling animation to clearly see which section you are looking at in case it feels you are lost. Custom buttons and ready-to-use device mockups are two additional features for you to use and avoid wasting time finding them online. Developers behind New Age template thought about everything. Included LESS files are for in-depth modification options when the need arises. This bright and solid template with call to actions located at strategic places across the layout will hugely help with the promotional part of your business. Make sure you get the most out of it and be in complete control of the product. You will manage it effortlessly what makes it very user-friendly. If your product is ready for the launch and you need a quick solution for a website, New Age template will do its thing and make it happen for you. Assembling an LP with Landing Page free Bootstrap 4 website template has never been easier. It is all pre-made for you. You only need to start adding your content, links, images and other whatnots and it is done. It might sound simple and too good to be true, but it is as real as you and me. And on top of it all, it is, like mentioned, completely free of charge. Download the template right now and start putting it to use immediately. Sooner rather than later, you will have a page finished and it will be already attracting new guests. Jump in with both feet and start promoting digital or physical products and services. From the live preview, you will see the simplicity in the design which is more than perfect for promotional purposes. The last thing you want when announcing a new product or service is that too many effects and animations distract visitors and get them forget what they came for in the first place. With Landing Page template, that will not happen. Fixed navigation follows the user throughout the whole browsing experience. Content sections and overall design is responsive for those who spend time on the internet using their smartphones. Furthermore, included are Font Awesome’s custom icons, PSDcovers’ device mockups and images by Death to the Stock Photo. 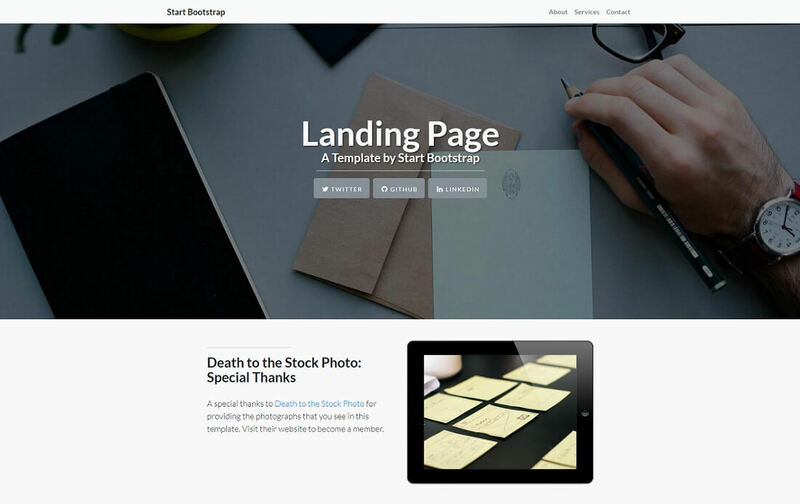 Be ready and fully equipped with Landing Page template. You are in for a fun treat with which you will produce a cozy website for your freelancing business. With Freelance free open source Bootstrap website template, you get a chance to enable a comfortable experience. Speaking of experience, it will be a comfy one for users browsing from any device. Indeed, the template is responsive and easily adapts both to small and super large screens. It is important that a website of an individual professional looks of top-notch quality on any screen size. Especially when it comes to the contact form. Template sports a mobile-friendly form with floating labels. And the PHP file of the form is easily editable so sending and receiving emails will be kids’ stuff. Portfolio gallery is structured as a grid with hover effects. Each image opens in a popup where visitors can get more information about the project they are looking at. Links to final products can be included in the description section. The navigation of Freelancer free Bootstrap 4 website template is sorted with a menu which collapses on-scroll. Scrollspy is there to take care of different components in collaboration with the menu. Without further ado, it is time to start putting together the crucial part of your successful business – WEBSITE. Coming soon pages can be used for many purposes. The most commonn ones are site launch or product launch. When used for product or service launch, comming soon page can be a great way to intrigue and pre-sell visitors. 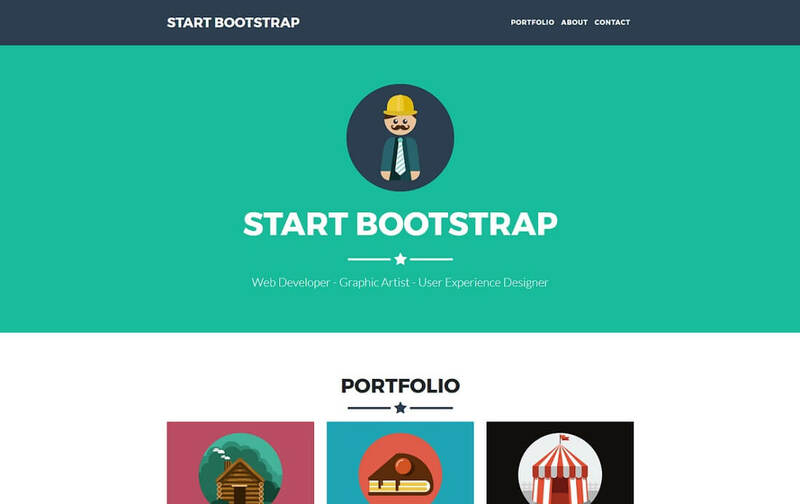 A template with all the features and must-haves is Infinity free Bootstrap template. A one-page template with a distinct look which will help you grab attention and turn unique visitors into fans and later on, customers. Infinity template has four main sections, home, about, service and contact. They are more than enough to provide full details but still not overwhelm guests. The home section features a large countdown timer, title, text and a call to action. Not to mention, parallax background. Further down, the visitor will find all there is he or she needs to get familiar with what you will be offering the world shortly. When it comes to free templates, you might find on the web some which are low in quality and minimal in features. You will not find those here. Even when it comes to a simple coming soon page, it is packed with features of an almost premium product. We could essentially say that Infinity has an infinite amount of options. One Page Wonder is a nice and simple free template if you are in a serious hurry with establishing a website for your project. Or even your client’s project. It is more of a starter product based on Bootstrap 4 Framework for one-page websites. Responsive web design gives you a fluently working page across the whole specter of mobile devices and desktop computers. Content sections all adapt to the screen size of choice for a fine UX. For those who are interested in learning building pages for online projects, One Page Wonder is the tool to start with. Uncomplex and plain free open source product which you can use for whatever intention you have. Use it for personal purposes, to gain knowledge and skill, or create a working website. Top navigation is fixed, and header sports a repeating background image. You can easily edit different sections and please your creative mind with modifications. While many try to overcomplicate with their website designs, when starting out, it is best to keep things simple. You can always expand later and add other functions or completely redesign the look if necessary.